This is one of my favourite movies for two reasons: 1. it’s an amazing heist movie with humour and sharp wit and, more impressively, 2. it’s the best management of an all-star cast that I’ve seen in any movie. 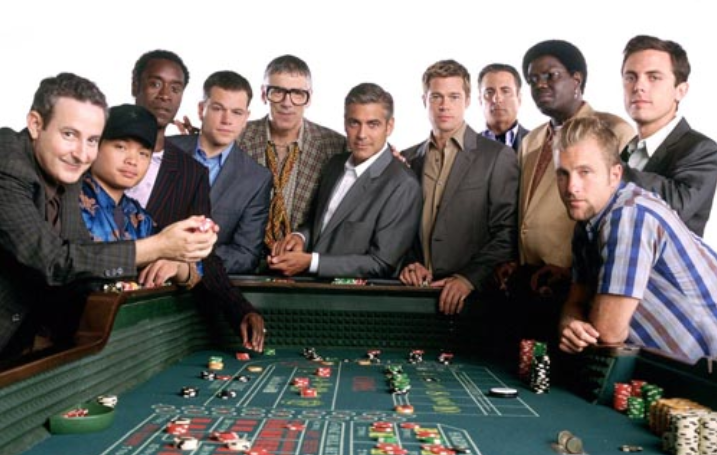 Okay, basic plot: Danny Ocean (George Clooney) is released from prison, after five years served, and immediately embarks on a mission to pull off the biggest job of his life and win back his now ex-wife, Tess (Julia Roberts). 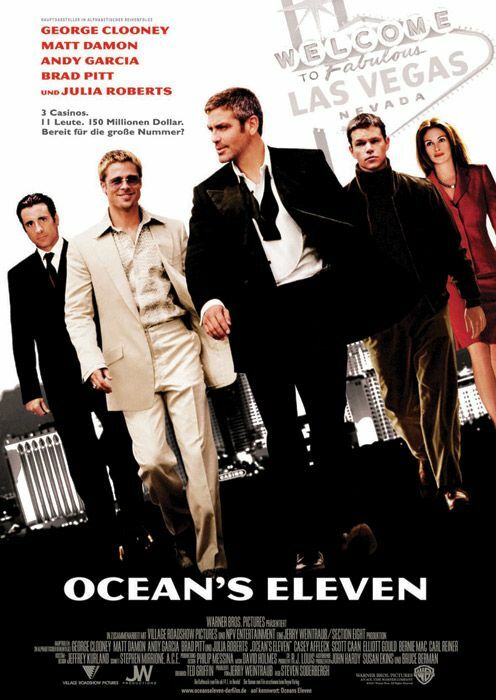 With the help of his partner, Rusty (Brad Pitt), Ocean assembles a crew of eleven men to steal over 150 million dollars from three Las Vegas casinos in one night. As far as heist movies go, this is one of my all time favourites. From the planning, to assembling the team, to the actual execution of the job, this movie is intelligent and witty from start to finish. I love the world and structure this movie creates. As with anything in life, the criminal world has a hierarchy, rules, regulations and its own jargon. These men aren’t lay muggers looking for a quick score, they’re professionals at the top of their field; their field just happens to be partaking in illegal activities. This level of professionalism and skill makes the daring nature of the task ahead of them even more enjoyable. They have to be at the top of their game and the way they overcome the challenges that come with a crime this scale makes for really entertaining viewing. But even more impressive than the slick, well-thought-out execution of the crime is the chemistry of the cast. I mentioned how I loved the management of the cast and I think it all came down to the individual actors putting their pride and egos aside and doing their part (no matter how small) to make the overall story enjoyable. This movie has the likes of Brad Pitt, George Clooney, Julia Roberts, Matt Damon, Bernie Mac and Andy Garcia to name a few – huge stars – and for them to be content with reduced amounts of screentime for the good of the plot is quite admirable. More than that, this movie’s cast just seem like they’re having so much fun throughout this movie. 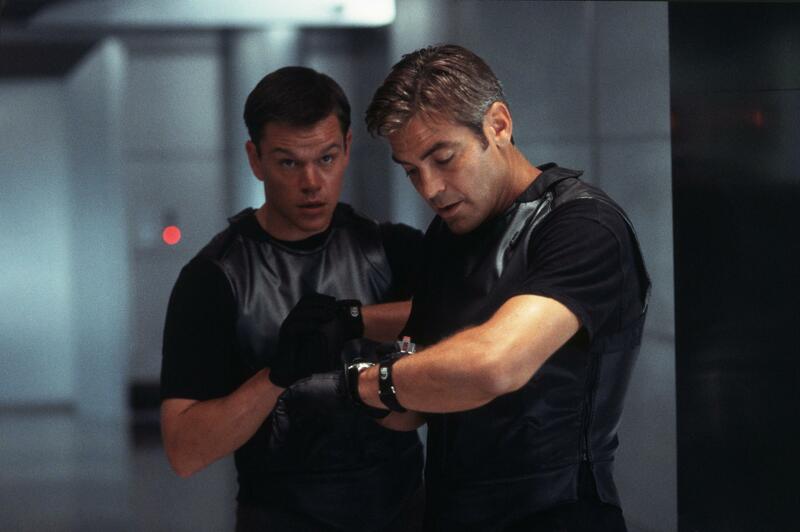 Pitt and Clooney are friends off-screen and they bring this rapport and camaraderie to their characters to great effect. I also have to commend this movie’s writing. The dialogue is crisp and extremely well-crafted. You not only get the sense that these people are all friends but also that they’re a part of this larger criminal fraternity. The heist and everything leading up to it are also incredibly well-written. I think that formula of dopping the audience into thinking that things are going wrong when they’re actually all a part of the plan is one that many movies (including this movie’s sequels) have tried and failed to replicate. It’s a meticulously well-planned robbery but there are still moments of luck and good fortune that keep you on the edge of your seat and make sure you actually care about the characters and their success. It’s been far too long since I’ve watched this. Definitely time to revisit it. Everything you write about its charm and wit is spot on. Great review.